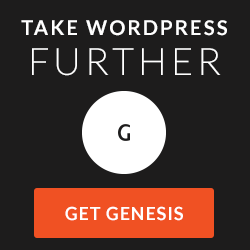 The Genesis Framework by StudioPress is a WordPress industry standard. What does that mean!? It means that over 194,000 people and businesses (myself included) use the the Genesis Framework with WordPress to build their sites. I talk a lot about the Genesis Framework and StudioPress child themes here on my site. Below are a few learning resources for you. The small print: Most articles below contain affiliate links, which means if you click-through and buy a theme, I get a little money. I use and am 100% confident in StudioPress themes, so I feel great about recommending them to you! Which StudioPress Theme is Right for You? * If you’re not a Lynda.com, but would like to take the courses I mention above, here’s a free 10-day trial.